Presenting an Evasion Mode Optimus Prime upgraded with Reprolabels and accessorized with Fans-Want-It's FWI-5 Advanced Weapons Collection. For the record, this is the Takara AD02 Evasion Mode Optimus Prime with the head of the Platinum Edition Evasion Mode Optimus Prime. We removed the head of our Platinum Edition Evasion Mode Optimus Prime when we upgraded him with the DX-9 Armor, so we changed our AD02's head because we're partial to the face plate..
We actually have seven Evasion Mode Optimus Primes in the Dungeon, including two KOs (Nemesis Prime plus the Prime that came with a DX-9 armor KO set). We did a quick count and there is a three-way tie for the most number of Optimus Prime variants in the Dungeon. 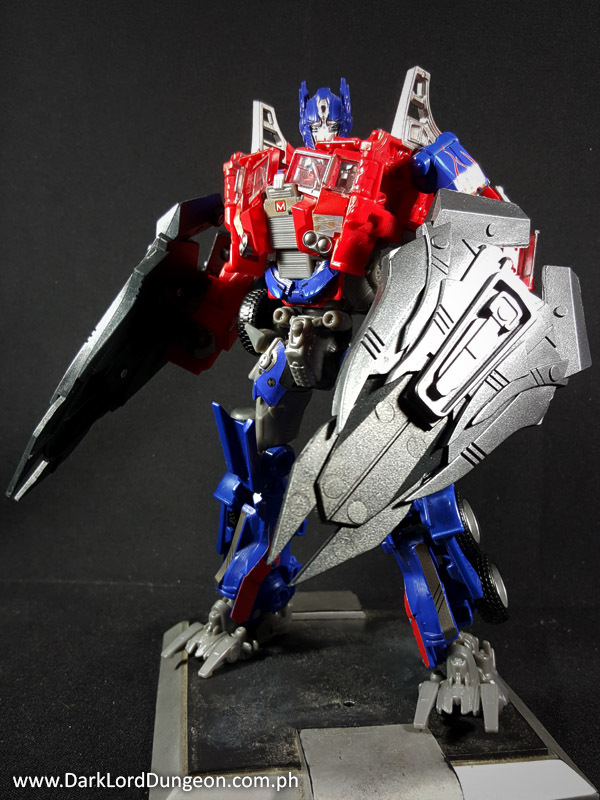 With seven variants each, the three-way-tie is between the Evasion Mode Optimus Primes; the Classics Optimus Primes and; the DOTM/ROTF Leader Class Optimus Primes. To break the tie, we shall soon acquire the Hasbro version of the Evasion Mode Optimus Prime that we more or less ignored. Presenting a Tie Interceptor from the Star Wars Titanium Series toyline. 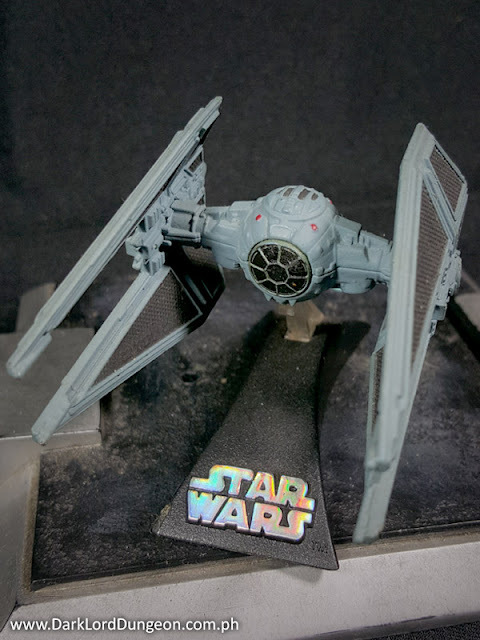 The TIE/IN starfighter or TIE Interceptor, was developed following the disastrous Fei Hu campaign between the Empire and the Rebellion where 286 TIE Fighters were destroyed by the T-65 X-Wings of the Rebel's Light Panther Wing - who suffered only 4 casualties. Of course none of this is canon now that Episode VII has rolled in, but given the proclivity of the writers of Star Wars Rebels to make the Empire's forces look like amateurs and complete idiots in the face of an incredibly technologically advanced Rebellion, who knows? Presenting the Green Lantern Hal Jordan from the DC Comics Icons toyline. We don't quite understand what happened in Convergence. Personally we've always thought that the so called :"Crisis" events of DC were so metaphysically difficult to understand. Marvel's recent version of "Crisis" was easier to understand. Both DC and Marvel ask that you purchase a boat-load of comic books if you want to have even the slightest hope of understanding them. Anyway, the current Hal Jordan has been completely rebooted, and instead of sporting a power-ring, he now sports a vintage power gauntlet and power-pack, a really bad haircut, a trenchcoat, and a hoodie that brings Hal back to the days when he was the Spectre. All in an effort to restore the reputation of the Green Lantern Corp by drawing the blame for the Corp's failure to keep order in the galaxy to him - being the figurative leader of the Corp.
Presenting a Limited Edition TWO-02C Orion (Not Optimus Prime) 2015 BOTCON exclusive TW01C02C - Hegemon & Orion GI Marvel Comic Book inspired repaint from Toyworld - enhanced with Reprolabels from Toyhax. Now, supposedly BOTCON banned 3rd party Transformers, so supposedly this is an underground "BOTCON Shadow-Convetion" exclusive that was released along with other 3rd party exclusives in the hotels surrounding the actual BOTCON. Supposedly only 200 of these were ever made for release in North America, but the box isn't numbered and we're in Asia, so I guess that doesn't hold true. 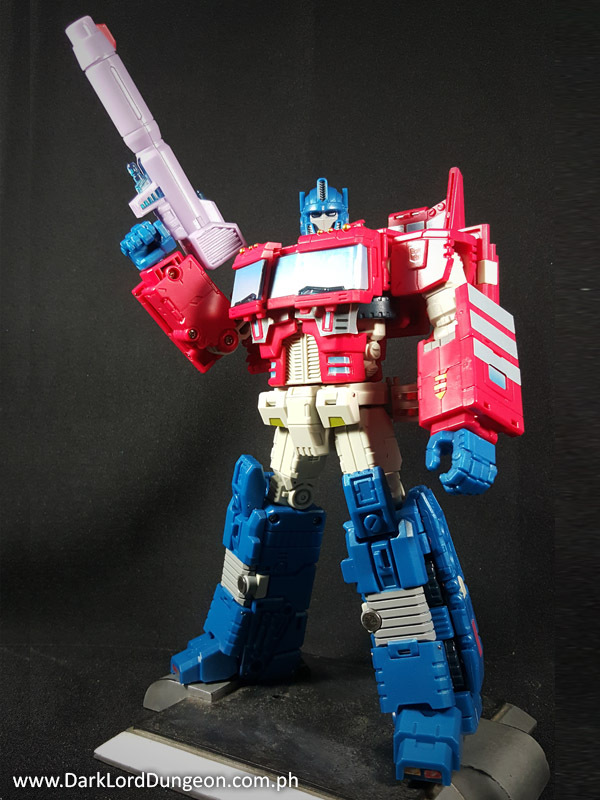 What is true is that this version of Orion (Not Optimus Prime), is painted based upon the colors of the G1 Optimus Prime as he appeared in the Marvel Comic Book series. 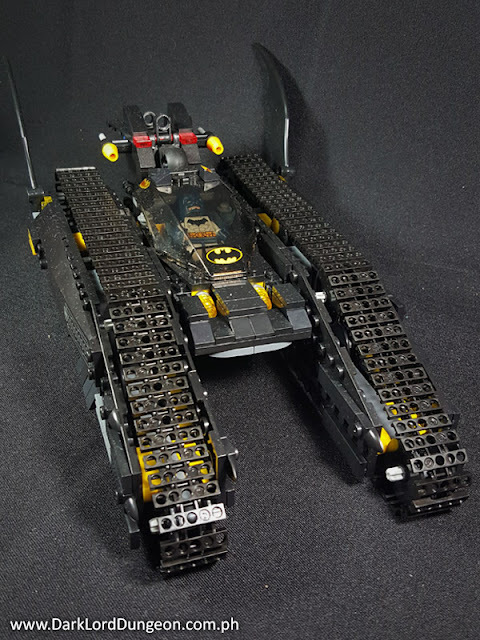 Presenting a knock-off (KO) Lego version of Batman's Bat Tank. The first thing that came to mind when we saw this was the tank used by Batman when he took on the boyscout Superman in Frank Miller's Batman: The Dark Knight Returns. Unfortunately it's waaay too small for that. The Batman Bat Tank is in reality 2/3rds of a LEGO playset entitled "The Bat Tank The Riddler and Bane's Hideout"
In the playset, the Bat Tank is supposed to crash through the gates of Bane's hideout before shooting up Bane's attempt to escape via a motorcycle and Riddler's escape via a nifty jetpack. On Amazon, the playset will set you back a whopping US$ 498.99 (Roughly PhP 23,452.53 plus shipping). This Lego KO Super Heroes Batman Bat Tank from DeCool was purchased for PhP 1,500 (roughly US$ 31.91). Presenting the Dark Lord Dungeon Toy of the Year Awards for 2015! It's that time of year when we go through the Dungeon's statistics and determine what you - the readers and visitors to this site - really love (Which includes things we hate sadly, but yeah, thanks for visiting). We have a winner for each month, and a runner-up. The Toy of the Year Award is given to the monthly winning figure that we feel influenced our lives the most. Feel free to comment, argue or react in the comments section below. Happy New Year to all and thank you very much for visiting our little blog.